International HS at Prospect Hts has children from 35 nations speaking about 25 languages. Making them sit through a MOSL test that has nothing to do with their education but only to do with rating their teachers is obscene. These 30 teachers said NO. 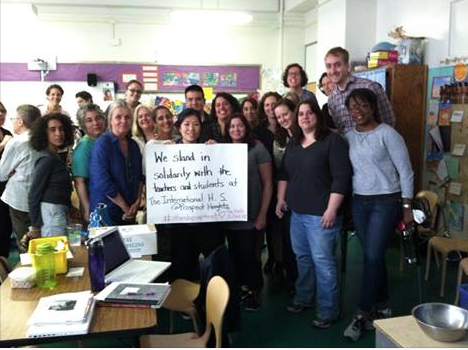 Teachers at the Earth School on the Lower East Side, send message of support. Some of them refused to give the ELA. 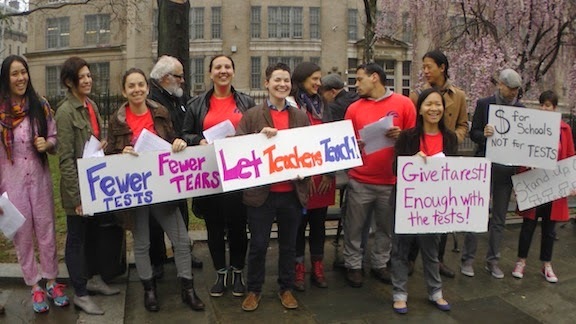 Teachers are refusing to give the test todaybecause they say it was constructed and formatted without any thought for the 14% of New York City students for whom English is not their first language.